is a Shinto shrine located at 大津 Ōtsu in Shiga Prefecture, Japan. The shrine became the object of Imperial patronage during the early Heian period. In 965, Emperor Murakami ordered that Imperial messengers were sent to report important events to the guardian kami of Japan. These heihaku were initially presented to 16 shrines; and in 991, Emperor Ichijō added three more shrines to Murakami's list. Three years later in 994, Ichijō refined the scope of that composite list by adding Umenomiya Shrine and Gion Shrine, which is now known as Yasaka Jinja. 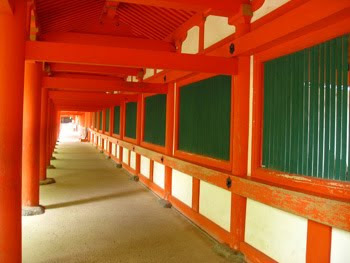 In 1039, Emperor Go-Suzaku ordered that one more shrine be added to the grouping created by Murakami and Ichijō -- the Hie jinja. This unique number of Imperial-designated shrines has not been altered since that time. A branch of Shinto that took shape in the Tendai sect, based on the cult of the Mountain King (Sannō) at the Hiyoshi Taisha (alt., Hie Taisha), tutelary shrine (chinjusha) for the temple Enryakuji. 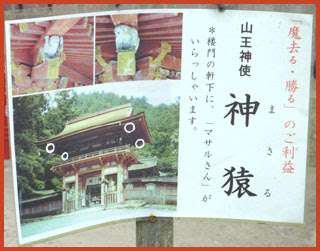 Its early modern doctrines that concern the shrine Tōshōgū are specially distinguished as Ichijitsu Shintō, the "Shinto of the Single Reality." The original Hie deity was the mountain kami on Mt. Hiei; interaction between it and the Tendai sect began with Saichō's founding of the Enryakuji. It used to be on the middle day of the monkey (naka no saru　中の申) of the Asian lunar calendar, therefore it is also called "Monkey Festival". It dates back to 1303. The cutting of sacred sakaki branches happens on April 3. On the "day of the horse" the mikoshi were carried to the mountain top at midnight. An the 12th the mikoshi are pulled out in a nightly procession illuminated with large pine torches and on the main day 7 large mikoshi parade the streets.
. WKD : Sakaki tree (sakaki 榊) . Hiyoshi Taisha Shrine is the head shrine of approximately 3,800 Hiyoshi, Hie and Sanno shrines throughout Japan. The history of Hiyoshi Taisha is long. It is recorded in "Kojiki," the oldest historiography in Japan written in 712. Its vast premises (about 430,000 m2) of this shrine are laid at the foot of Mt. Hachioji, east side of Mt. Hiei. The shrine is comprised of two zones, Higashi Hongu (West main shrine) and Nishi Hongu (East main shrine), with many smaller shrines in the area. In the Muromachi Period, the heyday of Hiyoshi Taisha Shrine, 108 shrines were located on its grounds and another 108 shrines outside the shrine premises. Among many shrine buildings, main halls of Higashi Hongu (West main shrine) and Nishi Hongu (East main shrine) are designated as national treasures. Also, many structures of this shrine are recognized as important cultural assets of Japan including worship halls of the both Higashi Hongu and Nishi Hongu, Nishi Hongu Ro-mon Gate, the red two-storied gate with the carving of a monkey, and Sanno-torii Gate. Spectacular shrine pavilions of architectural beauty, which were built in the Muromachi Period and the beginning of Edo Period, are scattered in the deep forest Mt. Hachioji and along the torrents of the Omiya River. The beauty of the autumn leaves in Hiyoshi Taisha Shrine is renowned. The premises are illuminated at night during the autumn season. In springtime many kinds of cherry blossoms fill the prefectural road from Keihan Railway Sakamoto Station to the entrance of Hiyoshi Taisha Shrine. Also, Sanno Festival, the festival of Hiyoshi Taisha Shrine, is held in spring every year. This is a namikiri Fudo 波切不動明王. 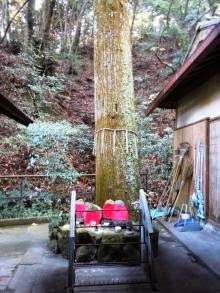 in the compound, where a large sugi cedar with a shimenawa is celebrated. Every month on the 28 fire rituals for Fudo Myo-O are held. The cult that began at Hiyoshi Taisha (Hiesha) at the foot of Mount Hiei. Originally, Sannō was the "mountain kami" (yama no kami) of Mount Hiei, but came to be worshipped as the protective kami of the Tendai (Chi. T'ient'ai) sect and of the temple Enryakuji. 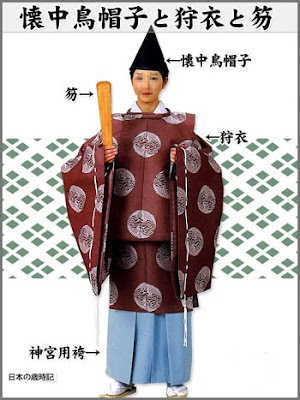 After the mid-Heian Period, when the temple Enryakuji developed as a kenmon (central land-owning institution) temple complex, imperial court devotion to Hiesha increased. Courts such as that of Enyū emperor (reigned 969 ~ 984) conducted occasional festivals there and finally recognized Hieisha as one of the "Twenty-two Shrines" (nijūnisha). Moreover, from the end of the Heian Period through the medieval period, Hieisha became as popular as "Kumano's Three Peaks" (Kumano sanzan) as a pilgrimage site (sankei) among everyone from emperors and retired emperors to aristocrats and commoners. At the beginning of the medieval period, along with the popularity of belief in "child deities" (dōji) and "offspring shrines" (wakamiya), the popularity of Jūzenji shrine (currently called Jugegū – one of Sannō's seven main shrines) surpassed that of Hieisha's Ōmiya shrine in which Hiesha's principle "enshrined kami" (saijin) is worshipped. As the protective deity of Tendai temples and of Enryakuji or Hiesha's land holdings, Sannō "emanations" became worshipped (bunshi) throughout Japan resulting in the further spread of the cult of Sannō. Because Hiesha is located to the northeast of Kyōto, it became regarded as a guardian against the evil spirits entering the capital from "demon gate" (kimono) northeastern direction, and as a result sacred images (shinzō) of divine monkeys believed to be Sannō's "divine messengers" (shinshi) were enshrined in the northeastern corner of the Heian imperial palace. Hie Shrine in Numazu City, Shizuoka Prefecture, had been the head guardian shrine of 22 villages in the area before the Meiji period (1868-1912). The enshrined deities are Ooyamakui no Kami The guardian god of Mt. Hiei), Oomunachi no Kami and Ootoshigami. It is said that the shrine was founded by Fujiwara no Moromichi’s mother in 1100 in the clan’s manor, which was called “Ooka-sho” at that time. Fujiwara no Moromichi was a head of the Fujiwara clan and served as Kampaku and Udaijin. Having come into colligion with the Tendai monks in Mt. Hiei, he ordered to attack them in 1095. As some monks were wounded in the battle and this aroused anger of the monks, he was placed a curse and died young in 1099. Thus his mother transferred the three dieties of Hiyoshi Taisha Shrine in Mt. Hiei to appease the anger of the deities of Mt. Hiei. 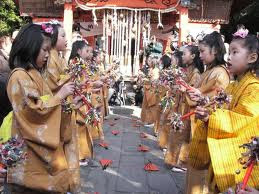 Traditionally, the school of Shinto which believes in the guardian deity of Mt. Hiei is called the Sanno (the King of Mountain) Shinto; hereby this shrine is also called “Sanno-sha”. The annual festival held for two days from September 23 every year is popularly called “Sanno-san” by the local people and enjoyed as the representative event of the city that tells of the coming of autumn. The shrine is also famous for the collection of important old documents including Sanno Reikenki in Shihon-Chakushoku style (paper-based colored), which is a nationally designated Important Cultural Property. 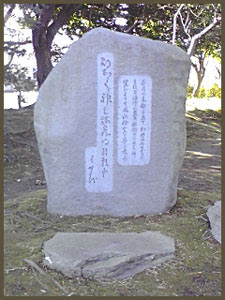 In the precinct is a stone monument inscribed with a poem by Matsuo Basho. Basho had left Kyoto late in the 10th lunar month and arrived in Numazu on his way to Edo early in the 11th lunar month, just when the gods are absentin Izumo and might have been on their way home too.
. WKD : Gods are absent (kami no rusu) .
. Numazu-juku 沼津宿 Numazu postal station . The shrine became the object of Imperial patronage during the early Heian period. In 965, Emperor Murakami ordered that Imperial messengers were sent to report important events to the guardian kami of Japan. 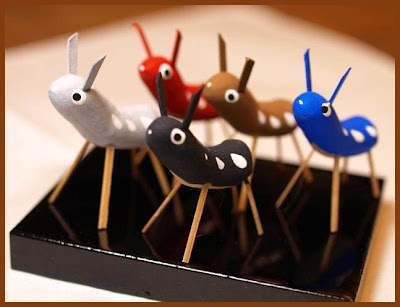 These heihaku were initially presented to 16 shrines including the Sumiyoshi Shrine. 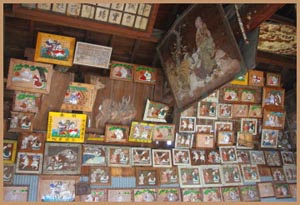 Monkey amulets from shrine Hagi Hiyoshi Jinja in Saitama. 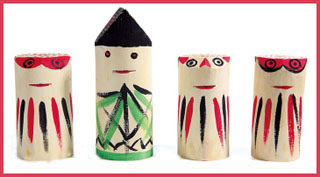 They are simple wooden dolls with simple monkey faces. The wood is taken from the trees in the temple ground, a kind of willow, doro no ki 泥の木／白楊 (doro yanagi). People used to stick one needle into the monkey, at the part they were acheing themselves,　or when the children got a stomach ache or other complaint, and hoped for the deity to cure their disease. (byooki sa saru － may the disease go away). They put the monkey on their shelf for the gods and prayed to it. The monkey would then take on the disease and heal it, as a kind of migawari, personal substitute . 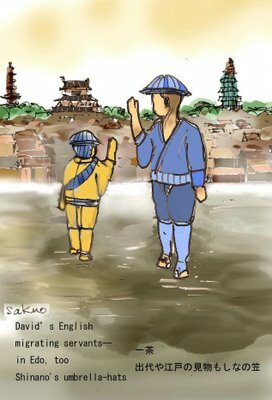 When the person gets better people would bring the monkey back in an act of gratitude (osame no saru 納めの猿). They are sold on the special market during the festival on the third sunday in January. At this shrine, there is also a yabusame festival, shooting arrows from horseback, once in three years.
. Saru 申 / 猿　Monkey Amulets .
. Migawari - personal substitute amulets . ***** . Shrine Karasaki Jinja 唐崎神社 .
. Ise-Shima 伊勢志摩 と伝説 Legends about Ise-Shima . Ise Grand Shrine (伊勢神宮, Ise Jingū) is a Shinto shrine dedicated to goddess Amaterasu-ōmikami, located in the city of Ise in Mie prefecture, Japan. Officially known simply as Jingū (神宮), Ise Jingū is in fact a shrine complex composed of a large number of Shinto shrines centered on two main shrines, Naikū (内宮) and Gekū (外宮). Purportedly the home of the Sacred Mirror, the shrine is arguably one of Shinto's holiest and most important sites. shinbyoo 神廟 Shinbyo, "a sacred place for the deity". another name for the Ise Jingu Shrine. Also used for other great shrines or shrines that hold the remains of a dead deified person, for example Tokugawa Ieyasu. The Grand Shrine at Ise is closely related to the rice culture of Japan, with its own rice fields for ritual purposes and a "sacred dining hall" for the deities.
. The Japanese Rice Culture and Ise Shrine . mikeden 御鐉殿 "the sacred dining hall"
. shinden 神田 / saiden 斎田 rice paddies for rituals . An envoy who was sent from the Imperial court to the Grand Shrines of Ise (Ise Jingū) to present offerings (hōbei 奉幣) for the Kannamesai. Also referred as Ise no reiheishi. A reiheishi was one type of royal "messenger" (hōbeishi) who brought offerings to shrines. From the medieval period onwards, the presentation of offerings for the Kannamesai was referred to as reihei (regular offerings), and thus the envoy was called a reiheishi. It was customary to dispatch the messenger on the eleventh day of the ninth month. The chief messenger was selected by divination from amongst the Ō clan. Officials of the Jingikan (Department of Divinities) surnamed Nakatomi, Inbe, or Urabe accompanied him. The first recorded reiheshi was sent in 721. 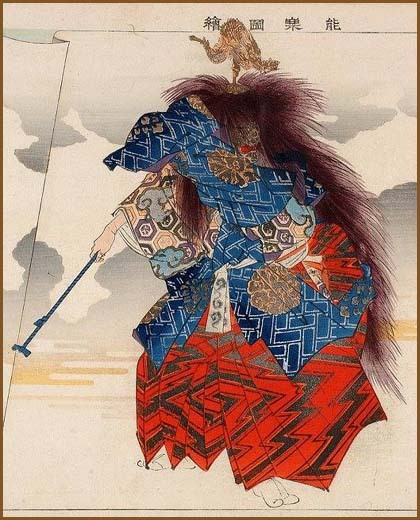 The practice was discontinued after the Ōnin Disturbance (1467-77), but was revived in 1647 in the Edo Period. However, prior to this (in 1646) the Nikkō reiheishi was initiated. This was a practice in which the court sent messengers to the "main ceremony" (reisai) held at the Tōshōgū in Nikkō where Tokugawa Ieyasu was enshrined. During the Edo period, this latter reiheishi was better known, and thus in contemporary documents the word reiheishi usually implies Nikkō reiheishi. Offerings of heihaku made to shrines and imperial tombs by order of the Emperor. 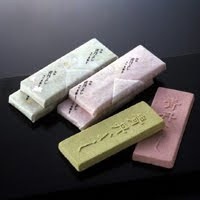 The term also refers to an envoy who bore these offerings, (alternatively called the hōbeishi). The characters can also be read as hōhei. The hōbei usually accompanied an imperial message (senmyō) but the paper used for the message differed according to the shrine: for example, the paper used for The Grand Shrines of Ise was a deep blue (hanada-iro), and that for Kamo Shrine was crimson (kurenai-iro), while for other shrines, yellow paper was used. After the Ōnin War (1467-1477) they ceased entirely, except for the offerings sent to the Grand Shrines of Ise. 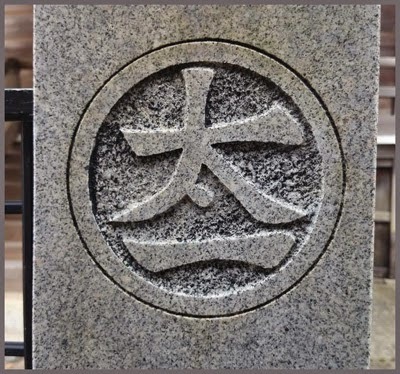 Currently hōbei are sent to Ise Shrine and the other venues of imperial rites known as chokusaisha and also to imperial mausolea for Shikinensai memorial rites. Envoys who carry offerings from the Association of Shintō Shrines (Jinjahonchō) to various shrines are currently called kenpeishi. source : Inoue Nobutaka . Kokugakuin University. A rite at the Ise Shrines celebrating the imperial lineage’s divine ancestry by offering first fruits to Amaterasu Ōmikami on the seventeenth day of the tenth month; the harvest festival of those shrines. 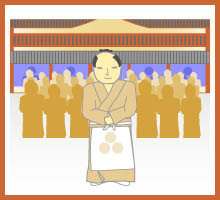 the emperor was to dispatch the imperial ritualist (hōbeishi) on the eleventh day of the ninth lunar month to perform the offering in the Daigokuden (which was known as the Koyasumidono in ancient times). The term reihei, referring to the imperial tribute offered in this ritual, first appears in the fifth year of the Yōrō era (721). 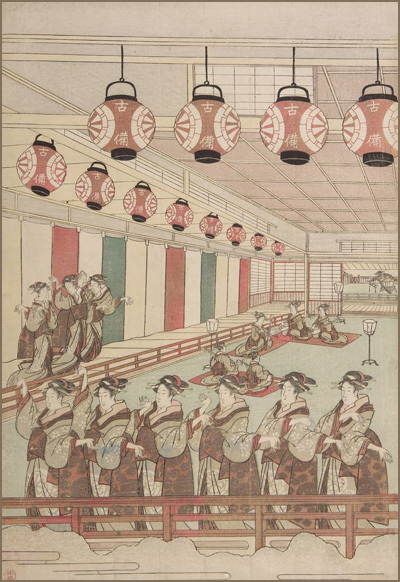 on the seventeenth day of the ninth month, within the palace the formal rite (haishiki) was to be performed at Kōtai Jingū and the “distant rite” (yōhai) was to be performed at upper and middle palaces by the one-hundred ministers of the court. This proclamation rested on the view that, in rites for the imperial ancestors, the Kashikodokoro (because it enshrines the yata no kagami, or sacred imperial mirror) was spiritually linked to the Ise Shrines; and thus the Kashikodokoro was regarded as a substitute (godaigū) for the Ise Shrines within the palace. 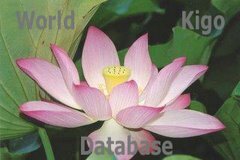 Thus, on the day of the kannamesai festival, both “worship from afar” and direct worship of the imperial ancestors by the emperor himself (shinsai) were performed within the imperial palace. With the change to the solar calendar, the seventeenth of the ninth month fell at a time when the harvest had not yet ripened, so in 1878 the ritual was moved to October. source : Nakanishi Masayuki . Kokugakuin University. 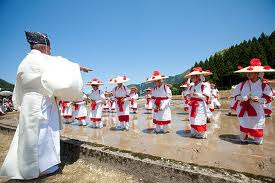 O-kage mairi お陰参り　（おかげまいり）"Thanks pilgrimage" or "blessing pilgrimage"
"festival of the honorable rice fields"
Before the official rice planting at the small town of Yamada, offerings of rice, fish and fruit are made to the deities. Then the priests and shrine maidens plant the rice which will be harvested by them in autumn and then used for the offerings at the shrine. Used to be on May 20, but now a sunday close do this date. 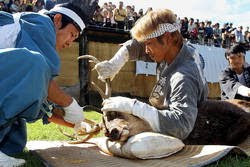 In the village of Isobe, it is done on June 24. 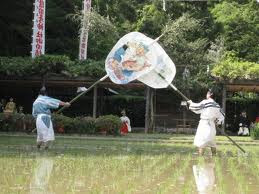 When the planting is over, two priest with large fans perform a dance along the path between the rice paddies. Performed at the Izo no Miya, see below. This takes plase every 20 years, started more than 1300 years ago. The shrine buildings at the Naiku and Geku, as well as the Uji Bridge, are rebuilt every 20 years. This is part of the Shinto belief of the death and renewal of nature and the impermanence of all things (wabi-sabi). It is also an opportunity to pass on building techniques from one generation to the next. 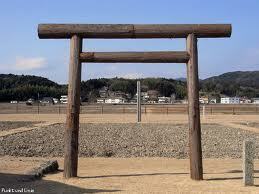 The next rebuilding of Ise Shrine is due in 2013. Everyone has pushed others in the crowd.
. WKD : Jingu Shikinen Sengu in 2013 . 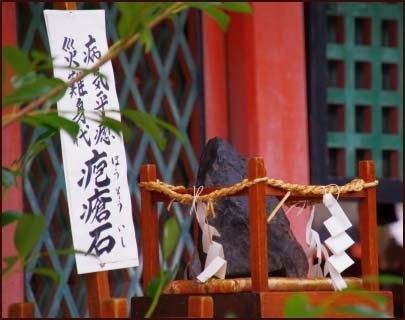 From the shrine Koo Daijingu 皇大神宮 amulets 大麻(taima)（お札） are presented to the other Ise shrines in Japan. The head priest of each shrine will then give them to the parishioner families. In olden times, priests would walk all the way throughout Japan. At the Emado hall of votive tablets at the Saigu Shrine in Mie, 多気郡明和町, this ritual is held at the last day of the year of the lunar calendar. 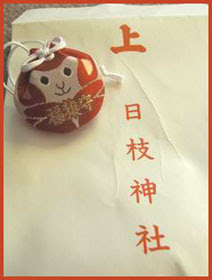 The old ema are replaced and the good or bad luck for the coming year is foretold. This shrine is about 20 km away from the main Ise shrine. At the shrine Kainan Jinja 海南神社 in Miura Peninsula Kanagawa. The women come together, sing and dance.
. sagichoo 左義長 Sagicho fire and dance . Ise Ookagura is a theatrical dance in the Shinto religion. The dance troupes traveled around remote areas for those who could not visit and worship at the Ise Shrine. The history of Ise Ookagura dates back more than 600 years. The performance is composed of two elements: “dance” from shishi-mai lion dance and “music” called houkagei, which later became known as Daidougei or street performance. 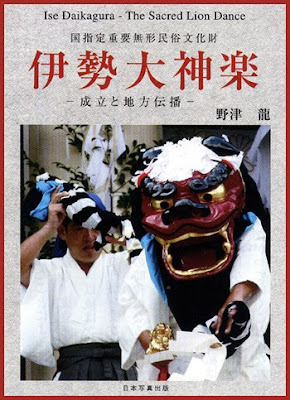 Ise Ookagura starts with a slow and elegant bell dance, followed by the Shiguruma Dance and the humorous Leap Dance, in which Sarutahiko (a monkey boy) jumps around a sleeping shishi lion. The houkagei music performance has a wide repertory, including the Music of Ayatori (“cat’s cradle”) in which performers manipulate wooden poles freely and the Music of Plates, in which performers do dish-spinning tricks with long poles, to pray for a rich harvest. Between the performances, houkagei performers and a clown act comically together. The performance then finishes with Rankyoku music. Ise Ookagura was designated an Important Intangible Cultural Asset by the Japanese government in 1983. Ise Ookagura, which originally started with 12 troupes, is still preserved by a handful of troupes that travel around Japan to pass down their historical culture to future generations. This is one of the most famous folk songs and dances. It spread over most of Japan because the Ise Pilgrims have been singing it. 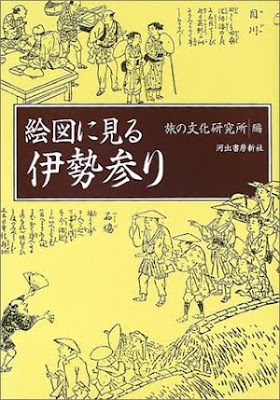 The drama "Ise Ondo Koi no Netaba" was premiered in the 7th lunar month of 1796 in Ôsaka, produced at the Kado no Shibai by the zamoto Fujikawa Hachizô III]. 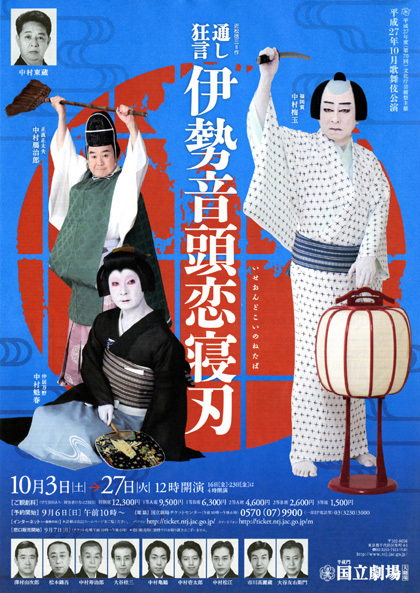 The play is loosely based on a real killing spree which took place in Furuichi (aburaya Sôdô), and which caused a sensation, about two months before the play's premiere in the 7th lunar month of 1796. The murders that inspired it having taken place in summer, "Ise Ondo" is a "summer play", with characters wearing light cotton yukata and using fans, and the Aburaya House of Pleasure's curtains being decorated with patterns of flowing water and floating bowls. CLICK for more kabuki photos ! A man named 惣五郎 Sogoro once finished planting a large rice field, when he found a young fox dead by the field side. So he burried the poor animal and said prayers for its soul. "Hey you rice-planter Sogoro, we pulled them all out!" It must have been the parents of the young fox, who by mistake thought he had killed their child. Sogoro took pity on them too, sat by the field and explained the events again and again. "Sorry we pulled your plants out! But now, they are all replanted!" Next morning he found some 鏡餅 offerings in front of his door and all the fields were planted as before. This is a separate shrine within the Ise compound, where the Taue field-planting takes place.
. Yamaguchi Seishi 山口誓子 . In August the great tides of the Pacific Ocean roll into Matoya Bay and, after passing through a narrow strait, enter the Izoo Lagoon. A god is enshrined at the Izoo Shrine there, and the great tides come all that way to worship the god. There is now a beautiful red bridge over Matoya Bay 的矢湾大橋 and a memorial stone with this haiku by Seishi.
. WKD : hazuki 葉月 (はづき) leaf month, . 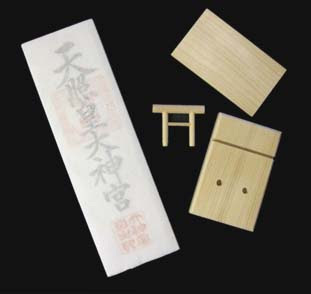 Itoin Senbei, ito-in senbei 絲印煎餅 Senbei with a "stamp like a thread"
. Toyouke Oomikami 豊受大神 (とようけおおみかみ) . The goddess of agriculture and industry in the Shinto religion. Worshipped at the Lower Shrine, Gegu 下宮 in Ise. She offers food to Amaterasu. 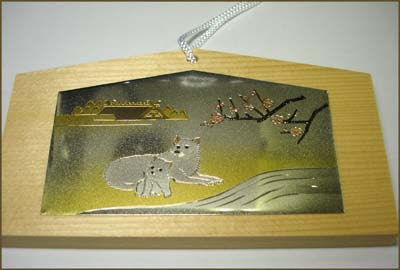 an explanation about the chigi 千木 "1000 roof beams" of a Shinto shrine.
. Eto 干支　Zodiac Animal Amulets .
. 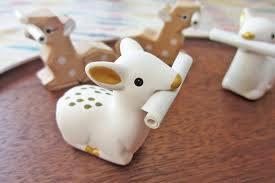 Folk Toys from Mie .
. WKD : Ise - Geku and Naiku - and HAIKU . From the Poem Collection "Days of spring" 春の日. A hill dedicated to the sun goddess Amateru, Mount Kamiji is located in a garden in the inner precincts of Ise shrine. 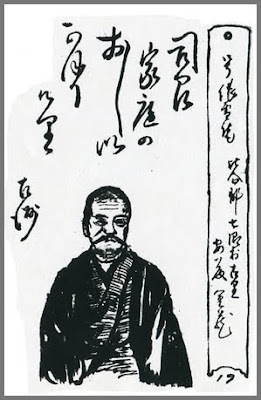 Since Issa composed the poem in First Month in Shinano Province, 300 kilometers north of Ise shrine, he must have relied on memory and imagination when composing this haiku. Issa bows to the sacred hill. More accurately, "the head, by itself" is bowing without conscious intention on the part of the poet. For this reason, I first translated zu ga sagaru literally as "the head bows," rather than "my head bows." However, in a note on a similar haiku in which a head "by itself bows," Shinji Ogawa writes that first person, "my head," preserves the poem's intensity in English.
. kamigaki 神垣 the "Fence of the Gods" to the inner shrine .
. 'O-Ise-san in Tokyo' - 東京大神宮 Tokyo Daijingu .